A Year of Being Here: William Ayot: "Anyone Can Sing"
"Anyone Can Sing" by William Ayot, from Small Things That Matter. © Well at Olivier Mythodrama Publishing, 2003. Presented here as posted on the poet's website. 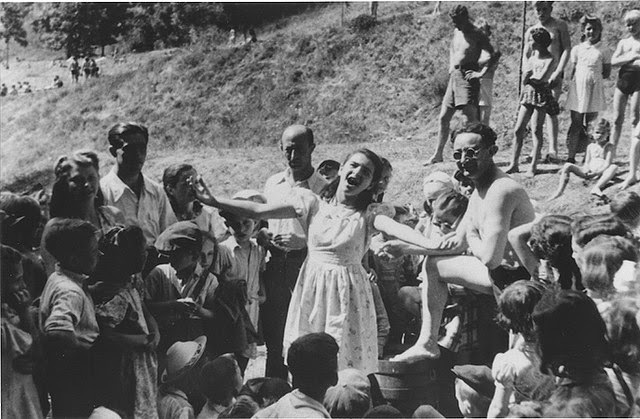 Art credit: "Young survivor sings at Ulm DP [Displaced Person] camp," photograph courtesy of Lillian Gewirtzman (nee Rajs), Holocaust survivor and schoolmate of the girl in the photo, United States Holocaust Memorial Museum Photo Archives.